DataSunrise Data Audit is a tool for non-stop monitoring of all activities on Azure SQL Database. While your system works it will keep track of every operation. Data leak investigations can’t be conducted without audit trails, moreover, regular examination of audit logs might help to reveal upcoming attacks and malevolent or careless employees. Security starts from being aware of what is happening in your database. DataSunrise collects comprehensive information on user activity and changes made to the database. Audit logs are used for investigating cybercrimes and prevention of upcoming threats by detecting suspicious activity. 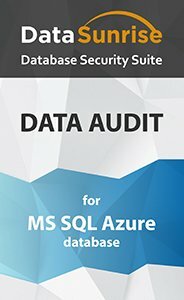 Data Audit performs non-stop monitoring of your Azure SQL database and helps to reveal attempts of user password hacking, access right abuse, SQL injections and other suspicious activities including unauthorized operations of company employees. DataSunrise Data Audit is easy to deploy, it doesn’t slow down the system. Unified graphical interface with a lot of customizable features makes it easy to work with. Support of Syslog protocol enables to integrate with SIEM systems that provide real-time analysis of security alerts. Self-learning SQL grammar analysis system creates a whitelist of assumed safe queries according to typical operations for given environment, which simplifies further customization of a firewall. Notifications of security policy violation enable to learn about malicious operations as soon as possible, so that administrators can timely react to the issue. More detailed information on monitoring feature is available here. Government and regulatory agencies oblige companies working with confidential data comply with security and privacy mandates, such as Sarbanes-Oxley Act, Health Insurance Portability and Accountability Act, Payment Card Industry Data Security Standard. DataSunrise provides sufficient functions to observe given standards. Continuous monitoring allows to prevent hacker attacks and malicious actions of company workers while logs of audit allow to investigate security breaches. Using sophisticated technologies DataSunrise Data Audit helps to build a reliable security system on cloud-based Azure SQL database.